Sojourner Truth: “We visited La Saline, a part of impoverished Port-au-Prince, that has historically been a center of resistance going back to the Haitian Revolution of 1804. Today, it is a stronghold of support for Lavalas, the popular party headed by former President Jean Bertrand Aristide. 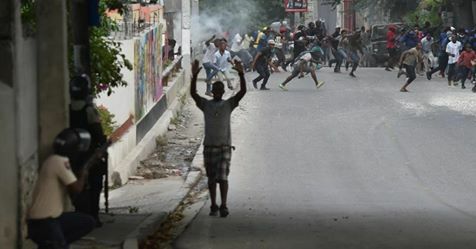 The massacres have been the largest in Haiti since the July 23, 1987 massacre of peasants under the Duvalier dictatorship. Evidence shows that perpetrators of the massacres have a cozy relationship and backing from the present Haitian government of Jovenel Moise. Indeed, the methods used to torture and kill are reminiscent of the brutal Duvalier days. People are hacked to death. They’re burned alive. Their bodies are left on the street to be eaten by wild pigs and dogs.